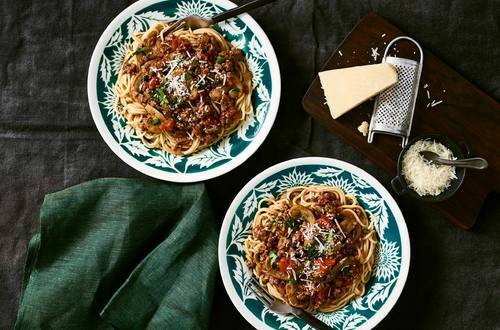 Add a flavour boost to your Bolognese with our much loved recipe. Hours of flavour in just 45 minutes, need we say more? 1 Heat oil in a large pan and brown onion, garlic and mince. 2 Add Stock Pot, tomatoes, tomato paste, water and mushrooms. 3 Bring to the boil and simmer for 30 minutes. 4 Stir through cooked spaghetti, and serve with grated Parmesan and parsley.